Good day! Welcome to a new post for Classy Cards ‘n Such I am delighted to be here today sharing a new card for this week’s CCNS challenge: Santa’s Reindeer. Christmas cards to me are the perfect kind of cards to use lots of sparkle and shimmer on, and of course today’s card is no exception! 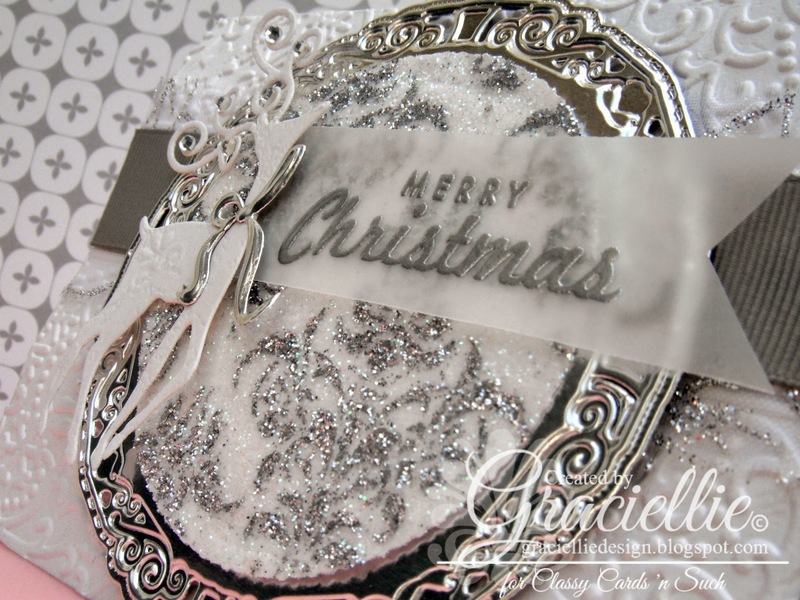 I created a monochromatic silver and white card using the double glitter technique, which consists basically in stenciling with with glitter. I have a complete step by step tutorial at Classy Cards ‘n Such blog. So make sure you click here, and learn how I made this card. I also have PDF tutorial available for you! If you’d like to download the tutorial please click HERE. Adhesives: 8 1/2″ x 11″ Double sided adhesive sheet, foam adhesive, two sided tape. I hope you enjoyed my card and tutorial. 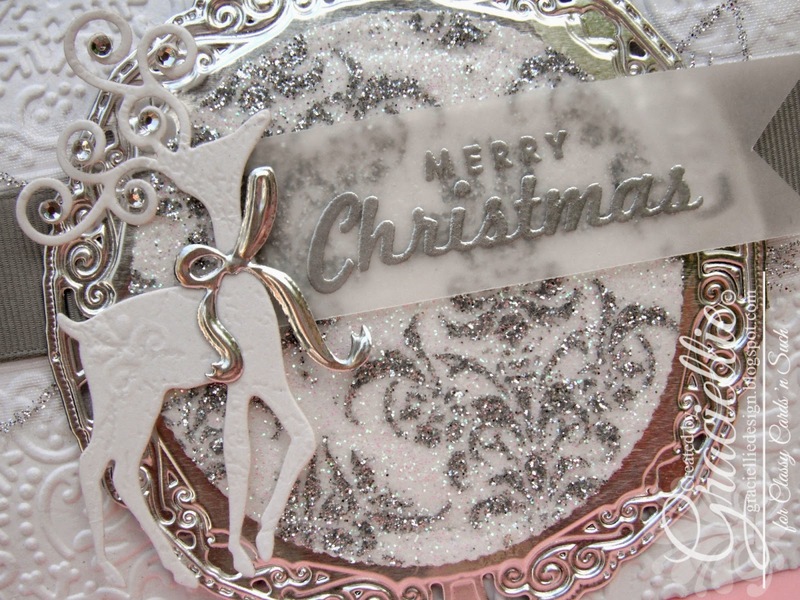 I love how my design resulted… The sparkle and the monochromatic combination sure make the card look very elegant. If you are looking for a more subtle look you can use this technique for smaller accents too, like flourishes and leaves and it would work just as nice. If you’d like to purchase the supplies I used to make this card, please click on the links listed throughout the tutorial to be directed to the store. 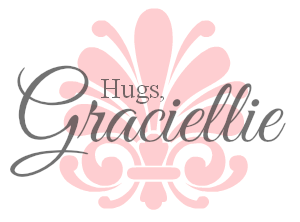 Remember to use my code Gracie-10 during checkout to get 10% off your order! I invite you to play along this week’s challenge. 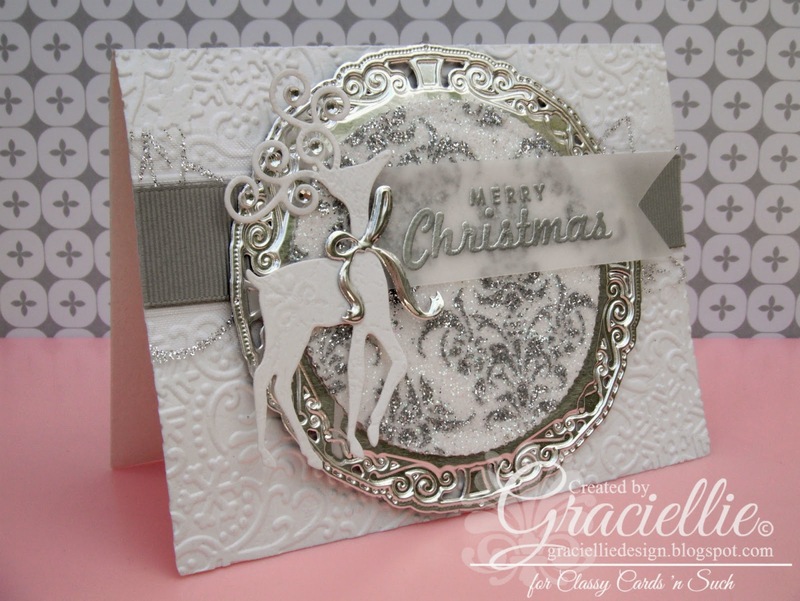 Follow the theme adding a reindeer to your project for a chance to win a prize from Classy Cards ‘n Such store. Gracie, this is a very gorgeous card. It has such an elegant look to it. This is really pretty! this is gorgeous, love what you have one, thanks for leaving a comment on my blog, Holly Jolly is fine now, I guess I was working on it when you came by, so it looked really weird. But thanks for the heads up just the same and we are a challenge blog, and not spam. Wow, this is so elegant and beautiful!! I love the sparkle!! The design is so fabulous!! Absolutely stunning!! I'm going to download the tutorial, too – thanks!! Oh Lisa you are the sweetest! It was a pleasure to give you my vote! Your project is beautiful and I'm crossing fingers for you. Hope you win! Thanks so much for your comment and your follow. I appreciate it! Hugs. A beautiful and elegant card – love it. Your card is Beautiful. Great job. I LOVE silver!! Oh my goodness!! This is BEAUTIFUL!!!! Beautiful creation, Love all the different elements and the sparkles. Thanks for sharing with us at Completely Christmas Challenge this week. We hope to see you again soon. This is such a beautiful and elegant Christmas card! Thanks so much for joining us at Merry Monday. Beautiful card! It's too beautiful to give that one away!! Oh thank you! Believe it or not is on it's way to Europe! LOL. Thanks so much Pamellia! I can't wait to see what you come up with.